I had some errands to run in the morning on the way to work, so it was already 9:30am by the time I walked up to the north entrance of the museum. I topped the hill and saw a Mercedes limousine and two shuttle buses parked on the sidewalk in front of the north entrance. Odd, since it’s a sidewalk and not a parking area. I then noticed a lot of people milling around by the vehicles and a few police-type fellows leading large German Shepherd’s around on leads. I considered walking around to the south entrance instead, when I heard a falcon cry and saw a peregrine come screaming in from the west, headed directly towards the north roof edge, right over the heads of all the vehicle people. Wow! No way! Are they BACK?!? I completely forgot about walking to another entrance as I tracked the falcon’s progress while running after it. It landed in the triangle cut-out of the north entrance just as I skidded to a stop below and dropped my bags. I fumbled around in my pack and finally found my binoculars just in time to see he was unbanded before he took off again, going west. I backed around a tree so I could watch his progress as he flew out over Grant Park. A deep voice startled me. I reluctantly stopped peering through my binoculars to look at the man who was speaking to me, obviously some sort of security person, as he had one of those ear pieces in his ear with the little curly wire coming out of it and was looking at me in that stern way only police types can. I explained who I was, pointed at my museum badge and asked him if he’d see, or heard, the falcon that just swooped right over his head. 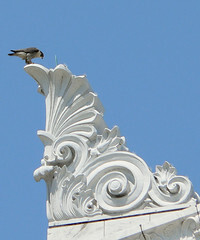 He looked at me with a dubious expression so I explained a bit about the peregrines and the pair on the museum. I have to admit, he still seemed skeptical, but he finally let me go in peace after making me promise to keep my bags with me because they were making the security team nervous. He watched as I gathered my things and I babbled a bit more about the birds. Authority figures make me nervous. I could really tell this guy wasn’t buying anything I was saying. 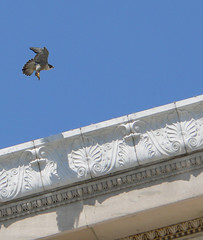 Most of the time, peregrines have insanely vexing timing. If you want to see their legbands, they are sure to always sit just perfectly for you to see them just until you have your scope up or your binocs out, then they sit down or their feet or fly away. If you want to track a certain behavior to guesstimate where they are in the hatching cycle, they will spend the 5 hours you sit and watch them sleeping. So, I was both proud and aghast when the male came back in from the west just as my babbling reached a fever pitch. In an act of falcon kindness, he flew in at an exceedingly high rate of speed in hot pursuit of two large crows. He hit one about 10 feet over our heads, not a killing blow, but probably just to drive the crows out of the nesting area. “HOLY CRAP!!! What the HELL was THAT?! ?” my new security friend yelled. I could see that the male had gotten the attention of the entire security crew, who all watched him careen around above our heads, mouths agape. “That’s the falcon I was telling you about!” Vindication. I spent the next 20 minutes re-telling peregrine facts and letting a few of them look through my binocs at the male, who had settled in on the north ledge. Finally, I waved goodbye and went up to see Mary. I had been out of the office the day before and she told me, rather excitedly, that they’d started seeing them again on the south side the day before. We discussed my day and decided it might be nice for me to spend my day downstairs, monitoring their behavior for the day. At 10am, I went down and set up camp on the south side of the building. Over the next few hours, Mary came down and sat with me. Although the peregrines were very active, oddly, they did not visit the south triangle cut-out very often at all although I saw them drop down on the north side time and again. Hmmm. Mary thought they probably had a nest on the south side and a food cache on the north side. Since the sun hits the south side of the building the entire day, the adults wouldn’t need to sit on the eggs as much for them to stay warm. We discussed where they’d been this last several weeks and came up with two possible scenarios. 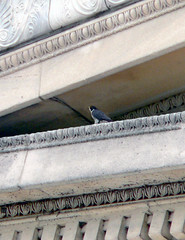 It’s possible they were there the whole time, sitting and brooding the eggs out off sight under the ledge. If so, we had just had colossally bad timing in our monitoring, as we’d managed to miss every single nest switch. It’s also possible that they had another nest somewhere else and it had failed, so they came back here to renest. I guess we’ll see! At 1pm, I decided to pack up and go sit on the north side. Man, what a lot of activity. Both adults were going in and out of the east side of the north triangle about every 15 to 20 minutes for the few hours I watched. Hmmm, indeed. ~ by Steph on April 30, 2007.